Di desain khusus untuk memberikan penghematan yang lebih besar bagi para pengguna dengan kebutuhan cetak tinggi seri printer Multifungsi Brother memiliki fitur Sistem Tinta Refil dengan harga botol-botol tinta yang sangat terjangkau berkapasitas cetak hingga 6000 halaman*. Selain dapat menikmati biaya pengoperasian yang rendah, pengguna juga diuntungkan dengan desain pintar yang sangat memudahkan proses pengisian ulang tinta! *Mengacu Pada Tinta Hitam. Tinta Warna: 5000 halaman. Perkiraan Jumlah Halaman Sesuai Dengan Metodologi Asli Brother Menggunakan Pola Uji Coba ISO/IEC 24712. Enjoy low running cost with exceedingly affordable ultra-high 6000 page-yield# ink bottles. Reduce ink wastage with individual ink bottle refill system that allows you to replace only the colours you need. Plus, easily produce 2-up and 4-up on a single sheet. This saves paper when viewing drafts or layouts. #Refers to black ink. Colour ink: 5000 page-yield. Approx. yields are extrapolated based on Brother original methodology using Test Patterns ISO/IEC 24712. Approx. yields are not based on ISO/IEC 24711. Refilling is easily done in 3 simple steps, thanks to easily accesible ink tank at the front. Smart design allows for ink refilling at an optimised 45⁰ refilling angle. This minimises ink leakage and takes the hassle out of refilling. Designed with embedded front-access ink tank and see-through cover, Brother’s Refill Tank System saves space effectively, and makes it easy to check how much ink is left. Featuring high print speeds of 11/6ipm* , time is saved when there are large volume printing tasks. Users can utilise their time more efficiently instead of waiting for their printouts. Furthermore, with paper input of up to 100 sheets, users avoid having to refill paper tray too frequently. *ISO/IEC 24734. 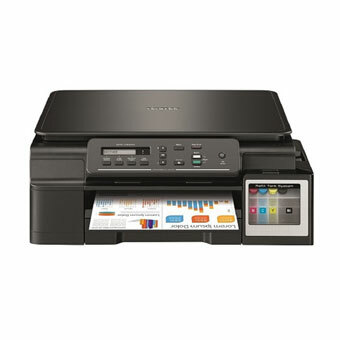 Click here to find out more about Brother print speed. Enjoy convenience of less-frequent ink purchases with ultra high-yield ink bottles. Plus, save valuable time as you can still print in black even if colour runs out. Save resources and share your multi-function centre across your wireless network. In addition, with the free iPrint&Scan app, you can now print directly from or scan documents straight to mobile devices within the same net work domain. Our colour inkjet series deliver consistent and high quality results with sharp images and crisp text. Our Multi-Function Centres offer unique colour enhancement designed to optimise your color prints with true to life colours. Brother black pigment ink* will provide you with sharp text printing on standard paper. It is water resistant so it won’t smudge. You get consistently sharp text every time.